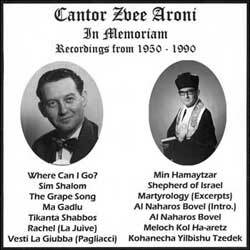 Notes This collection contains five earliest known recordings of Cantor Aroni's voice as well as one of his last recordings (1990). Through listening to these songs you can hear how his voice matured, but did not age. 1 - Vu Ahin Zol Ich Gayn? Composer(s) : Steinberg, D. M.